"215 +/- acre Willamette Valley farm with amazing hilltop home with spectacular 360 degree views. 110 +/- acres considered ideally vineyard suitable - Located next to Benton Lane Winery. 190 acres cultivated & 10 acre pasture and young timber area. Other improvements include 2nd home (manufactured) , 2-level building with office, large refrigerated cold room & storage, 8250 SF mechanical shop, 2-stall horse barn, 2 wells & creek"
"Presenting Alpine Vineyards, w/26 acres of vines and multiple varietals. Elevations range from 500' to 640' in the inversion zone of the Willamette Valley. Custom home once featured in House Beautiful magazine w/1565sf of deck to drink in the stunning vineyard & mountain views. 30x60 warehouse, designed to hold approx 15,000 cases. 24x48 tractor/implement shed. Spring on property w/1500gal holding tank + three wells for irrigation." "All about the 2 Views. 5 Acres on Top of the hill with Valley Views to the North and South. New Flooring and Exterior paint. A must see home." "Perfect for Home Business with so many possibilities from eBay sales, warehouse distribution, bakery, grocery store, wine tasting room, cabinetry, wrought iron, your dream. The residence is a 3 bedroom, 1 bath with 1600 square feet. the warehouse is Commercial Kitchen ready with a walk-up window and set up for commercial cooler plus ADA Restroom and upstairs storage. Total square footage is 4560." "OVER HALF ACRE RIVERFRONT COTTAGE W/GUEST HOUSE. ONLY 15MINS TO CORVALLIS & 25MINS TO EUGENE. ORIGINAL WOOD FLOORS. SOAKING TUB OVERLOOKING THE RIVER. NEW SEPTIC IN 2017 AND WELL/PRESSURE TANK IN 2018. GUEST HOUSE IS 552SQFT WITH FULL BATH & KITCHEN, 2BED LOFT. PRIVATE RIVERFRONT DOCK. LOTS OF ROOM TO GARDEN. RV PARKING. 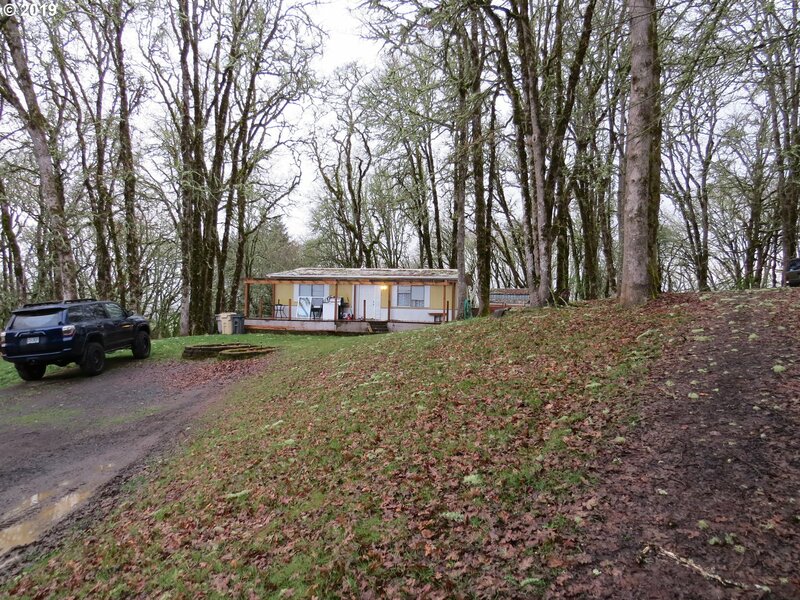 POSSIBLE 3RD CABIN W/ PWR & RIVERFRONT DECK. PERFECT FOR AIR BNB OR RENTAL INCOME. SELLER CARRY W/$100K DOWN 10YRS." "Are you looking for land with a view where you can live peacefully for CHEAP?? or looking for land to build your dream home on while living on the property? this is it. This little nugget has new laminate flooring throughout.The interior will surprise you, once your inside it opens up and feels much more spacious. Two storage sheds included. this property qualifies for VA loan, construction, CASH or conventional with 20% down."